Egg and sperm donation and so on. The hospital headed by one of the best infertility doctors offers the best infertility treatment in Mansa. We have the latest technology to carry out all the activities like surgeries, oral treatments, and checkups for all our patients. There are trained and experienced staff members to create a friendly environment for you to have the best experience possible. 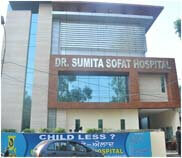 Dr. Sumita Sofat has worked on different and difficult infertility issues that have given good results. With the major conferences carried out by her outside India, there have been big developments in the infertility treatment sector. The best treatments are administered after consultations, advice and thorough checkups by the expert. The treatments are patient friendly and affordable. There are so many other services that we offer our patients like counseling and the related cycles of tests and treatment. Meet the fertility expert in India to attain a better life by accessing the best treatment with the latest technology. Your happiness is our pride.